Click images for full-size jpeg. Screen grab at 1440 x 900. WE ARE OLD-SCHOOL here at Plan59 and would probably be using vacuum-tube computers if they still made them. Certainly we are big fans of vacuum-tube video displays — Sony's Trinitron flat-screen Wega CRT monitors have been our display of choice since they were introduced in 1999. Unfortunately they are not very long-lived — our 21-inchers, the GDM-F500 and the unit that replaced it, the GDM-F520, each lasted only about three years until they began arcing and ghosting. When it came time to replace the 520 we discovered, much to our dismay, that Sony (as well as just about every other major display manufacturer) had abandoned the cathode-ray-tube market in favor of liquid crystal displays. AFTER 15 MINUTES of intensive research (i.e. 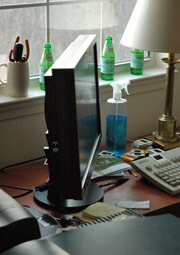 Googling) we came across the Eizo website. This is a company that takes its LCD displays seriously, with detailed product descriptions as well as white papers and spec sheets. Its ColorEdge series of graphics monitors includes the first video displays capable of reproducing the Adobe RGB color space. Eizo's wide-screen (16:10) ColorEdge TFT LCD displays can be hardware-calibrated by the user to ensure consistent results. The flagship CG models (in 22, 21 and 19-inch screen sizes) include the calibration device — it looks something like a mouse that rests on the screen. 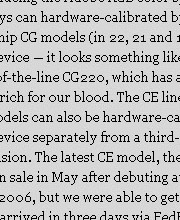 The top-of-the-line CG220, which has a street price just north of $5,000, was too rich for our blood. The CE line turned out to be more our speed — these models can also be hardware-calibrated but you have to buy the calibration device separately from a third-party vendor: GretagMacbeth, X-Rite or ColorVision. 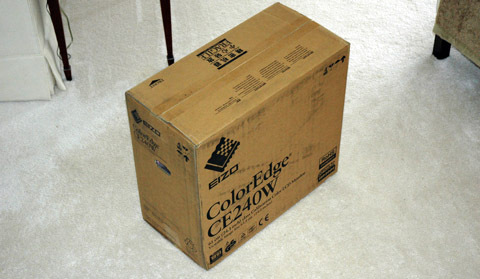 The latest ColorEdge model, the 24.1-inch CE240W, is supposed to go on sale in May after debuting at the IPEX trade show in England in April 2006, but we were able to get one through our friends at ColorHQ.com. It arrived in three days via FedEx and cost $1,800 USD. • Use the supplied DVI-to-DVI (digital video interface) connection cable, not the analog VGA-DVI adapter (also included). That might mean getting a new video card, one with a DVI jack. • The most "natural-looking" resolution is 1440 x 900. (Width needs to be height times 1.6) If you are used to a 21-inch CRT monitor set at 1024 x 768, everything will look about the same size, with the difference being the extra real estate — you have an inch of extra height and five inches more width. (The usable display on a 21-inch 4:3 monitor is 15.75 inches wide and 11.8 inches tall; the CE240W is 20.5 inches wide and 12.85 inches tall; area-wise, the CE240W display is 42 percent bigger.) 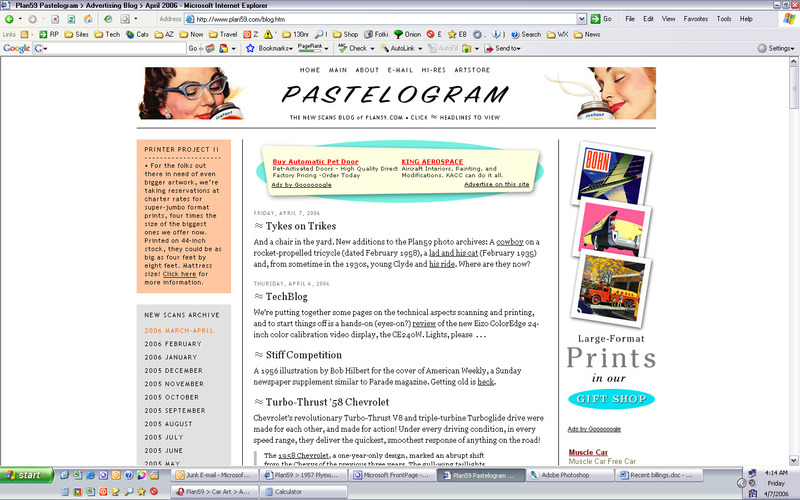 If you are willing to put up with slightly smaller UI and Web graphics, 1680 x 1050 is doable. • Turn off the adjustment for color temperature (i.e. use the default). • Set brightness between 30 and 40 percent. WHILE THE RESULTS are not quite as warm as the old Trinitron CRT — the increased brightness and contrast take some getting used to — the ColorEdge is far better than any other LCD we have used. It is the first liquid-crystal display we have seen that gives excellent results at anything other than native resolution. (Side note: Video and DVDs look great on the CE240W.) By the time it's ready for replacement — ColorEdge monitors have a 5-year warranty — SED displays should be on the market, combining the best of both worlds. OUR CE240W is connected to two computers through its two DVI inputs. It can serve as a USB hub; there's also a USB connection for calibration, as well as adjusting the screen settings if you don't want to use the onscreen display or the controls on the monitor itself. Which are very cool. Instead of little buttons it uses embedded capacitance sensors. You just lightly touch the appropriate silkscreened symbol on the bezel, and voila. 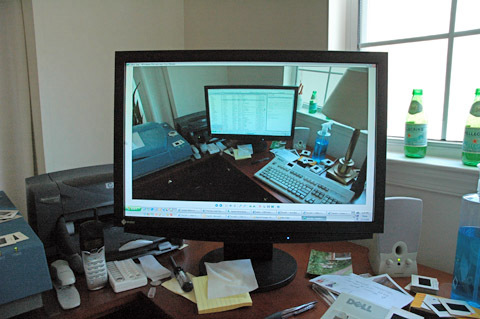 Switching between video sources is accomplished by touching "signal"; the mouse and keyboard use a KVM switch. 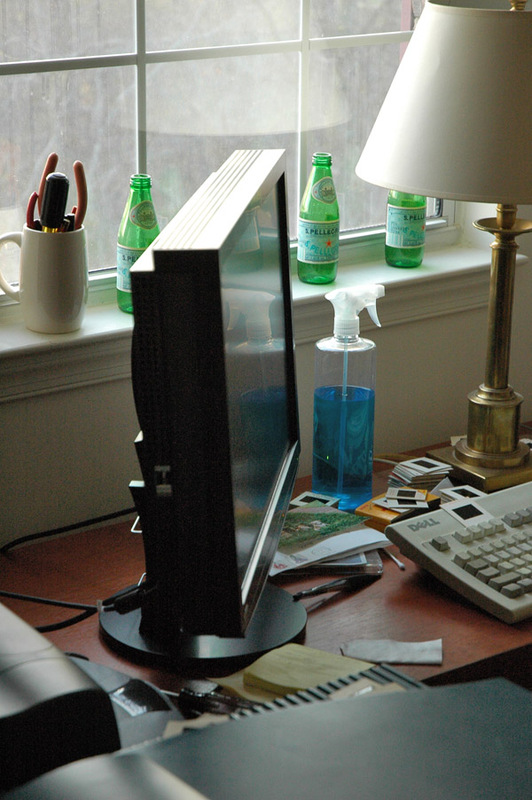 There are DVI KVM switches, but they start around $160.